Sundries posted this over on Facebook. McCartney's song, written for his Kisses on the Bottom, which celebrated some of the great tunes of the mid-twentieth century made popular by the crooners his parents loved listening to when Macca was a kid. My Valentine is a joyful song set to a minor keyed, bluesy tune. In this video, the guitar solo is actually played by McCartney's buddy, the actor Johnny Depp. On the original track, the solo is provided by Eric Clapton. But the atmosphere of a live performance with a band anchored by Diana Krall on piano was enjoyable, as was Joe Walsh's solo on My Valentine. I wrote about Brian Williams and the allurement of celebrity here. But my hope is that the country, which has seemed so gleeful in its condemnation of and laughter at Brian Williams, will forgive him and that NBC will reinstate Williams once the anchor has done "his time." How many of us, prone to exaggeration and telling what I call, "heroes of our own story" tales, haven't been guilty, unintentionally or otherwise, of the same wrongs as Williams? And most of us haven't been in the public eye when we've told such stories, meaning that we're not as widely and unceremoniously vilified for our exaggerations as Brian Williams has been. The Williams story is, as I suggested in that earlier post, cautionary. Those with aspirations to be famous should think twice about their ambitions. Fame is like money, of which Jesus said: "What good is it for someone to gain the whole world, yet forfeit their soul?" (Mark 8:36) If fame or money become our aims, we may gain both but lose ourselves in the process. Brian Williams, unlike many in the public eye, has admitted his wrong. Forthrightly, without excuses. Chastened, this man who has been, it seems, a responsible journalist, should get the grace and second chance that we all assume we ourselves deserve. Some feel that Williams deserves no consideration because he has a lot of money, as though money softens the blow, as though money were his motivation for being a journalist. These ideas miss the point. No amount of money can compensate for the guilt and regret Williams must feel right now. Nor can it give him the sense of fulfillment he likely felt from pursuing his calling as a fair-minded journalist. Unlike some public figures, whose "apologies" are nothing but recriminations toward those who hold them accountable or who view their mea culpas as pro forma hoops they need to jump through in order to gain the honors they believe they deserve, Williams seems genuinely repentant. His suspension seems to be an appropriate consequence of his breach of journalistic propriety. In other words, the "punishment" fits the "crime." But, having accepted his medicine, Brian Williams shouldn't be forced to be a scapegoat wandering in the wilderness for the rest of his life. In six months' time, Williams should be back at his desk on the NBC Nightly News. If not there, some other news organization should use his considerable talents. Why Were Old Testament Priests Required to Be Perfect Physical Specimens? At Living Water Lutheran Church, we're reading the Bible together over the course of 2015 and holding weekly gatherings to discuss the twenty-one chapters we've read that week. At last night's discussion, a really good question was posed: Why were the priests who offered the sacrifices made daily first in a tent in the wilderness and later at the temple in Jerusalem, required to be unmarred by physical defect? For the generations to come none of your descendants who has a defect may come near to offer the food of his God. No man who has any defect may come near: no man who is blind or lame, disfigured or deformed; no man with a crippled foot or hand, or who is a hunchback or a dwarf, or who has any eye defect, or who has festering or running sores or damaged testicles. No descendant of Aaron the priest who has any defect is to come near to present the food offerings to the Lord. He has a defect; he must not come near to offer the food of his God. He may eat the most holy food of his God, as well as the holy food; yet because of his defect, he must not go near the curtain or approach the altar, and so desecrate my sanctuary. I am the Lord, who makes them holy. One of the points that the editors of The Lutheran Study Bible make about these verses is that why "physical blemishes disqualified a priest from entering God's sanctuary or holy places...[the] disabled or misshapen were not regarded as profane, for the Lord allowed them to perform other tasks and eat holy food." Still, these qualifications, which come in a list of otherwise defensible ones dealing with things like sin and integrity, are jarring. It seems inconsistent with what we know about how God, as evidenced repeatedly in both the Old and New Testaments, loves all people. Just as animals with physical defects or blemishes [could] not be offered for sacrifice (22:19-22), priests who [had] a physical defect [could] not serve before the altar. Ritual purity [was] required for the sacred precincts of the altar, the sacrifice and the religious practitioner officiating at the altar in every religion in the ancient Near East. Priests [had to be] in perfect health and in full command of their bodies and senses. So, the concern behind the requirements in Leviticus seem to have been not so much with creating a kind of super race of perfect physical specimens to serve as priests, but to ensure ritual purity in every way surrounding the sacrificial system. Still this explanation is a guess at best and not very satisfying at that. On further reflection, I feel that a few other things need to be considered before we leave this question so uncomfortably behind. The first thing to remember is that some rules in Leviticus no longer apply. We've discussed this a number of times on this blog and in classes. In a nutshell, there are three kinds of Old Testament laws: (1) ritual/sacrificial law; (2) civil law; (3) moral law. The first two types have been rendered instructive but irrelevant for us today. The sacrificial system, along with priestly sacrifices, came to an end with Jesus' voluntary self-sacrifice on the cross. No further sacrifices are needed; we are saved by God's grace through faith in Christ alone. The Old Testament priesthood ended at the moment Jesus Christ died on the cross. The New Testament book of Hebrews describes Jesus as our "great high priest." Unlike the Old Testament priests, Jesus is both sacrifice and the One offering up the sacrifice, Himself. So, if the Old Testament Levitical priests were physical specimens, the great high priest Jesus, God in human flesh, was not. And maybe this gives us clues for the reason behind God instituting the physical qualifications for the priesthood we read about in Leviticus 21. Maybe ancient Israel, in the infancy of its historic mission to be God's "light to the nations" when these qualifications were given to His people in the wilderness, wasn't ready for priests who shared their weaknesses. Maybe only God Himself possessed the requisite empathy and compassion to be such a high priest. And maybe it was only after God Himself died at the hand of human weakness (and sin), then rose from the dead, that He was able to create a whole people--His Church--to share their weakness and God's strength with the world, and to confess their own weakness to God and be strengthened by His strong grace. Lots of maybes. But, it's clear that no matter how troubling Leviticus 21 may be for us, it's not the final chapter in God's plan for the human race. ...for X appreciated today. That's all. Just pray for X. Especially around noon Eastern time. Thank you. Yet, as a friend of mine once said of Macca, "Even when he's bad, he's good." By that he meant that even when the tunes are sappy and the lyrics absurd schlock, which has happened more than a few times through the years, McCartney's sense of melody and penchant for compelling arrangements can pull you in. I'm Carrying is a flimsy tune from London Town. But confession of a guilty pleasure: I love it. What man in his right mind wouldn't want to compose something like this for his woman? 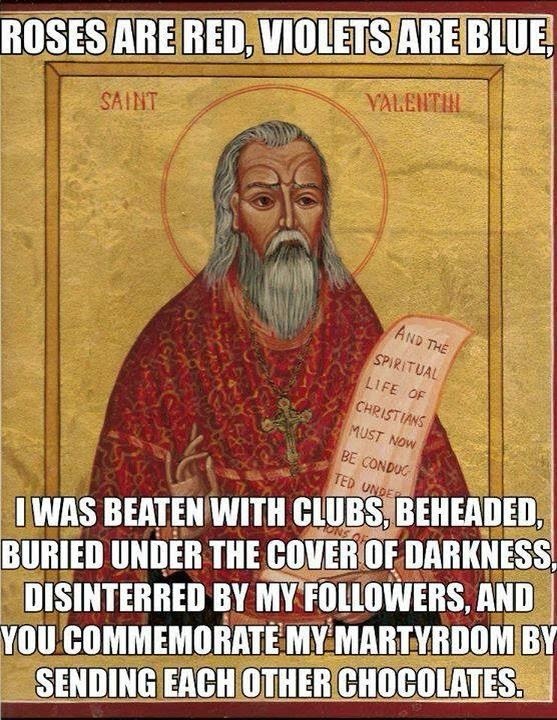 And my guess is that most women wouldn't mind being on the receiving end of this schmaltzy Valentine. Mistaking kindness for weakness in others is one of the biggest things we human beings make about others, I think. But kindness is a way love and true strength are enacted. If there's anything I learn from Jesus and the Bible, it's that love is expressed in actions, even toward those we find exasperating...or hateful. In Jesus Christ, God has done the ultimate kindness for the human race. He bore our sin on the cross in order to take the punishment, death, we deserve. Then He rose from the dead to take back from Satan and the evil of this already dying world the everlasting life that God intended for all of us. And then, through no merit of our own, He offered the victory over sin and death He had won, along with eternal life with God, as free gifts to all who renounce sin and trust Him to destroy the sin in us. The world mistook Jesus' kindness--His willing submission to death on a cross in spite of His power to evade it and to destroy those who took His life--for weakness. It still does. But Jesus expressed the very strength of God in His seeming weakness. The same is true for all who bear the Name of Christ, God in the flesh. God answered the apostle Paul's prayers for deliverance from a persistent "thorn in his flesh" by saying that He would not say, "Yes" to that prayer because, "...my power is made perfect in weakness" (2 Corinthians 12:9). God's power is manifest in those willing to have their emptiness and weakness filled by the One Who made the universe with His strength and His goodness. God's power too, is seen in the willingness of Jesus followers to serve others in precisely the way Jesus has served us on the cross and from the empty tomb. In what was the Gospel lesson in many churches across North America yesterday, we were told that Jesus healed the mother-in-law of His disciple, Simon Peter. Immediately afterward, Mark says of the woman that "she served them," meaning Jesus, Simon Peter, Andrew, James, and John. Some read this or hear this and are horrified. A woman gets healed and the first thing she has to do is serve others. Humiliating, right? But people who react in this way mistake kindness for weakness. Simon Peter's mother-in-law "got it" before her son-in-law did. She understood that when the God of the universe serves you and loves you, the only reasonable and appropriate response is to be a servant. She understood what James and John still had not gotten nine chapters later in Mark's gospel. The two were certain that Jesus was going to be a worldly triumph--Grammys, Oscars, Nobel Peace Prizes, landslide election victories, vast wealth, and military conquest in hand--and could make them His president and prime minister. "Grant," they asked Jesus, "that when you come into your glory, we'll sit on either side of you." Those who are truly great understand that in the kingdom of God which Jesus has brought into our world the last will be first and the first will be last. Status means nothing to them. As Grammy Award winner and Christian rapper Lecrae noted on his Facebook page on Saturday, as he found himself surrounded by musical superstars, "There is no one I can meet in the world to make me any more valuable than God has already made me." When you know that, in Christ, you have the approval of God, you can afford to look weak to the world. You can dare to be kind knowing that however much others may abuse you for it, God is with you and you can never be separated from Christ. Kindness rooted in the certainty that you belong to Christ always is an act of boldness and courage. The kind are subversives in a conspiracy with Christ to overthrow the kingdoms of this world and boldly proclaim that, "There is no king but the God we meet in Jesus and wouldn't you like to be part of His kingdom?" Never confuse kindness for weakness...especially in Christ or in those who strive to live faithfully for Him.